Now that I'm getting my mojo back, I've decided to focus the blog on places that I really like. One of them is the only restaurant on Second Street (between Union Ave. and Peabody Place that's not a part of The Peabody Hotel) that I haven't blogged about. This place was a favorite of mine long before I became a Flying Saucer regular and has been around longer than most restaurants in Downtown Memphis, let alone Second Street. The restaurant I'm talking about is Automatic Slim's, established in the early nineties by Karen Carrier. She's a well-known entrepreneur who owns many restaurants in Memphis, including the Beauty Shop. When I initially started going there, it was for its outstanding jerk-sauced cheeseburger. In addition to that, another Slim's favorite was the fried duck served with shoestring onions that totally rocked. Since those times, both the ownership and the menu have changed. However, the essence of the stylish restaurant has remained the same. So, with me reviewing places ranging from Second Street Shoppers to Texas de Brazil, I felt it was time to shed light on a longstanding institution. For starters, I want to highlight an entrée from Automatic Slim's dinner menu. With duck no longer a part of it, I decided to try another interesting entrée. While passing on Slim's shrimp and grits, I went with its cheaper cousin Mississippi Catfish and Grits that is nearly as good. The best part of it is the grits, which has a nice cheesy flavor deriving from white cheddar. Unlike better known places like Brother Juniper's, Slim's cheese grits doesn't have the sharpness in taste that I'm accustomed to. For me, that's good because I want my grits to complement the catfish and not overwhelm it. Speaking of that, the catfish is average by most standards. It is properly seasoned and fried in a way that most catfish aficionados are familiar with, but by itself isn't noteworthy. 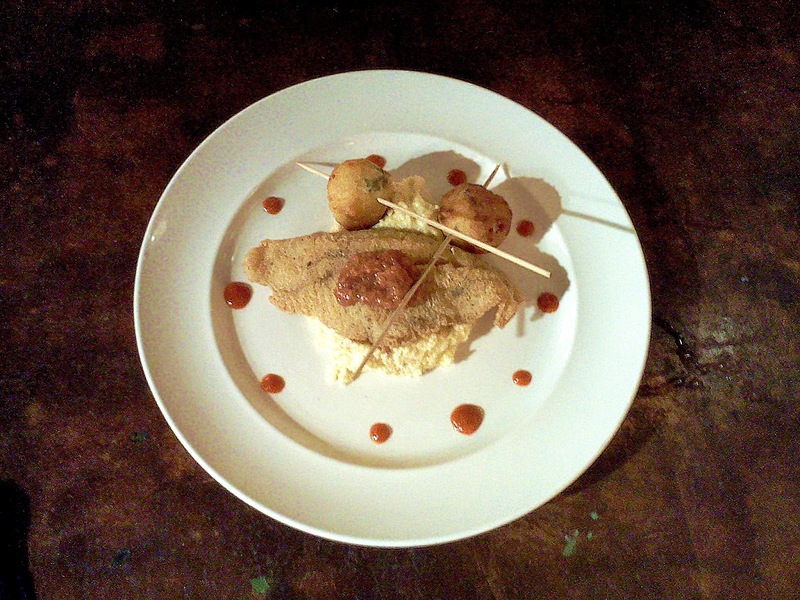 Fortunately, the grits and drops of hot sauce on the plate's edges add plenty of flavors to the catfish. Also doing this is the hushpuppies, stuffed with okra and white cheddar that is quite tasty. As a whole, Automatic Slim's Mississippi Catfish and Grits is a great entrée that I recommend others to try. SIDE NOTE: I learned an interesting story about hushpuppies. According to some sources, runaway slaves fed the cornmeal nuggets to the dogs tracking them. They did this to "hush" the barking canines. If that's true, then it's a Bicycle Bobby (president of the Squeal Street BBQ Team) "DAMN!" chapter in American History. On the night that I got the catfish, I ordered the Mac 'n Cheese as an appetizer. I didn't choose this at random, for the pasta dish has been a favorite in the past. From what I remembered, the last plate of Mac 'n Cheese that I had at Slim's was a simple concoction of macaroni, Parmesan and other cheeses (can't remember what types), bacon and herbs. It is similar to what Mollie Fontaine Lounge (another Karen Carrier restaurant) offers that's simply delicious. My expectation was for satisfaction along those same lines, something that Slim's delivered. Its current version is similar to the former, for the pasta features white cheddar, smoked Gouda and Parmesan cheeses (with the latter having the strongest presence), bacon, green onions and truffle oil. Like its predecessor, the Mac 'n Cheese was cheesy with a zestful taste. By itself, the appetizer can serve as casual bar food or an entrée-sized meal. As it relates to what I had later, it would have been a great match for my catfish (although not as good as what I had at The Four Way). 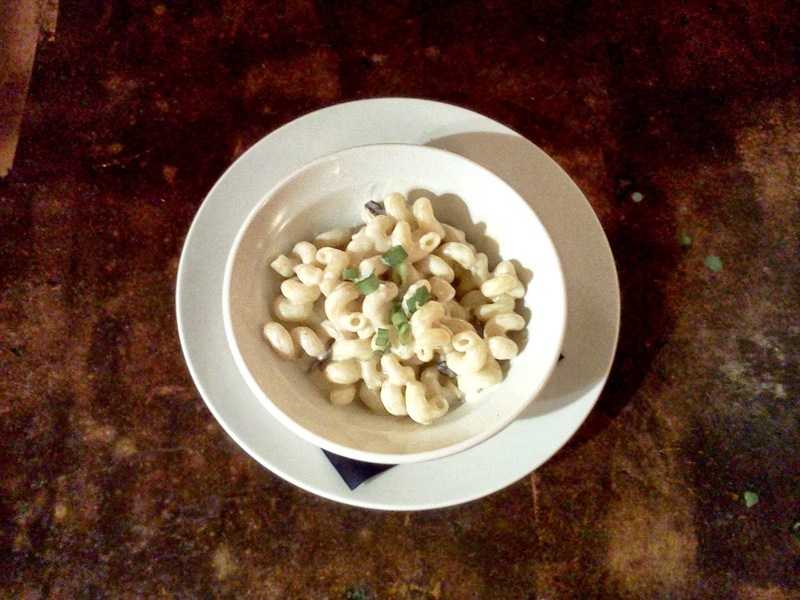 However one consumes it, Automatic Slim's Mac 'n Cheese is a tasty dish that's sure to please most. Earlier, I mentioned that a jerk-sauced cheeseburger was the first plate of food that I ate at Automatic Slim's. As much as I wanted to have it again, it is no longer on the menu. 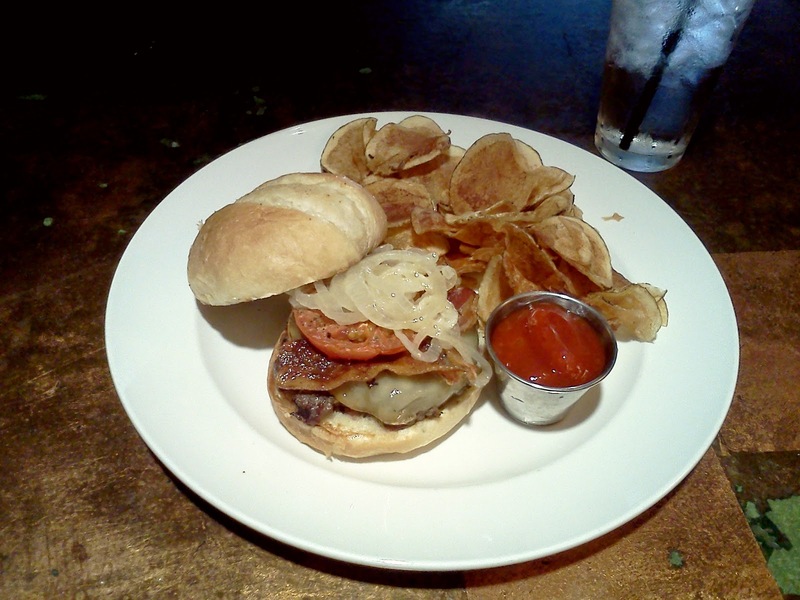 In its place is the Slim's Burger, loaded with smoked Gouda, caramelized onions (called "onion jam" on the menu), roasted tomatoes and bacon within a sourdough bun. The onions are dominant in the cheeseburger, contributing to a tangy aroma. The fresh sourdough bun is soft and meshes well with everything else in the cheeseburger. On the day that I got it, the restaurant cooked the burger the way I wanted (medium rare) that was indicative in appearance and taste. The end result was something almost as good as its predecessor. The burger comes with Automatic Slim's potato chips that were good enough to support the cheeseburger despite being a little overcooked for my taste. Overall, the Slim's Burger (available only from the lunch menu) is a really good cheeseburger that can hold its own with the best in Memphis. SIDE NOTE: As for why the jerk burger is no longer available at Slim's, it might have to do with the change in ownership. In an article about Bar DKDC, Carrier's newest restaurant (formerly Carrier's noodle and sushi bar Do), states that the restaurateur makes its jerk sauce with a secret Jamaican recipe. If it's the same sauce that was used in Slim's jerk burger, I might have to make a trip to Cooper-Young soon. At this point, I might have ended this review, but I didn't want to do it without mentioning something from Automatic Slim's weekend breakfast/brunch menu. I wanted to get something interesting, so I chose the Crawfish Eggs Benedict. Compared to similar entrées, the breakfast dish is decent. In fact, take away the crawfish and the entrée isn't any different from comparable restaurants like The Majestic Grille. 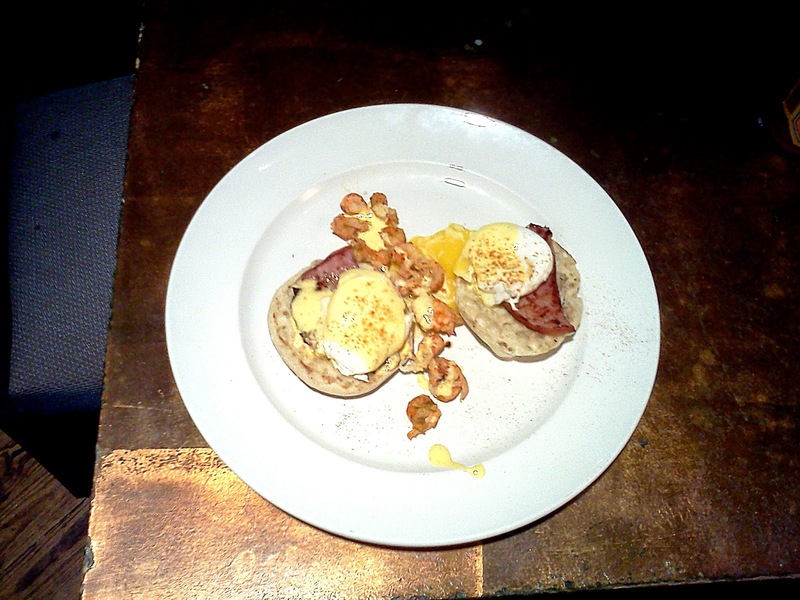 In fact, The Majestic's version of Eggs Benedict include sides of biscuits and diced potatoes mixed with sautéed onions and red and green peppers. To get the equivalent from Slim's, a diner has to request it. When I ordered it, I got the fried potatoes that don't have a mix of other veggies. All combined, the cost of my breakfast (which didn't include biscuits) at Slim's was higher than The Majestic's Eggs Benedict offering. Even after factoring in the crawfish, The Majestic has the better deal. While I won't reveal my opinion about which entrée is tastier, it's clear that Automatic Slim's provides less breakfast for the buck. SIDE NOTE: It's interesting that Automatic Slim's makes its own ketchup. It's sweet, likely benefiting from the fresh tomatoes used to make it (even the seeds are in it). 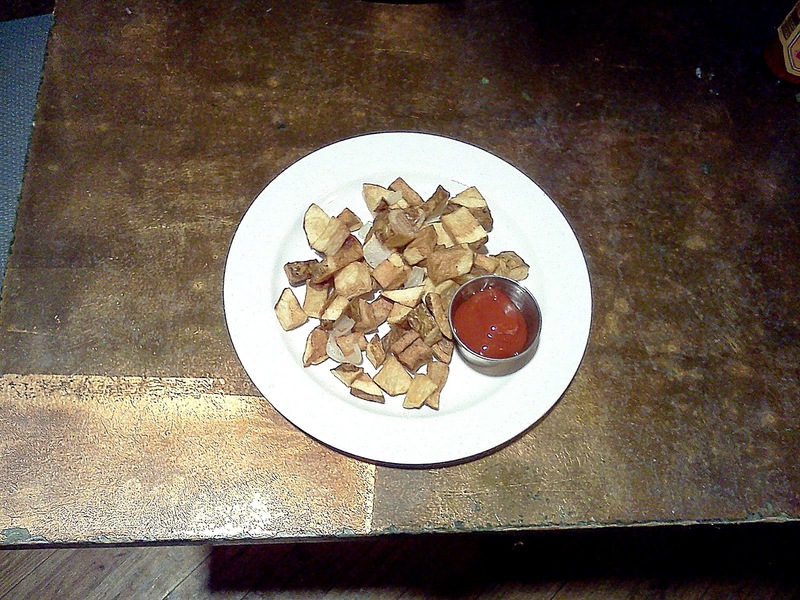 The ketchup offers a balance to the extra crispy taste of the potato chips and fried potatoes. From my visits to Automatic Slim's, I've become reacquainted with a place that's been a favorite for a long time. While it isn't quite what it used to be, it's still a good place to go for lunch, dinner or even breakfast. It seems that the current owners are carrying on the tradition of a restaurant that's a hip place to dine and socialize. The interior design of Slim's is artsy, which is inviting to those who are accustomed to that kind of environment (and is consistent with a Carrier-inspired restaurant). Automatic Slim's is worth checking out, for there is a lot to like.